In a speech to the Review Conference of the Non-Proliferation Treaty in New York earlier today, U.S. Secretary of State John Kerry disclosed new information about the size of the U.S. nuclear weapons stockpile. First, Kerry updated the DOD nuclear stockpile history by declaring that the stockpile as of September 2014 included 4,717 nuclear warheads. That is a reduction of 87 warheads since September 2013, when the DOD stockpile included 4,804 warheads, or a reduction of about 500 warheads retired since President Obama took office in January 2009. The September 2014 number of 4,717 warheads is 43 warheads off the estimate we made in our latest FAS Nuclear Notebook in March this year. Second, Kerry also announced a new number we have never seen in public before: the official number of retired nuclear warheads in line for dismantlement. As of September 2014, the United States had approximately 2,500 additional warheads that have been retired (but are still relatively intact) and awaiting dismantlement. 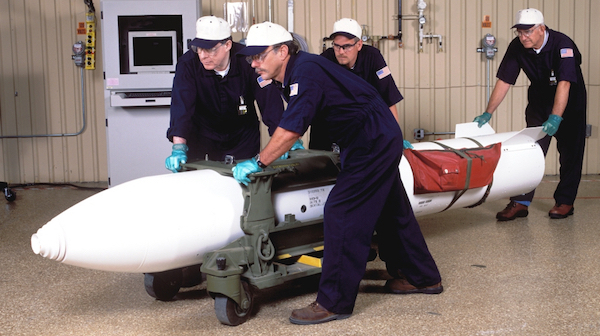 The number of “approximately 2,500” retired warheads awaiting dismantlement is close to the 2,340 warheads we estimated in the FAS Nuclear Notebook in March 2015. “Over the last 20 years alone, we have dismantled 10,251 warheads,” Kerry announced. This updates the count of 9,952 dismantled warheads from the 2014 disclosure, which means that the administration between September 2013 and September 2014 dismantled 299 retired warheads. Under current plans, of the “approximately 2,500” warheads in the dismantlement queue, the ones that were retired through (September) 2009 will be dismantled by 2022. Additional warheads retired during the past five years will take longer. How the administration will accelerate dismantlement remains to be seen. The FY2016 budget request for NNSA pretty much flatlines funding for weapons dismantlement and disposition through 2020. In the same period, the administration plans to complete production of the W76-1 warhead, begin production of the B61-12, and carry out refurbishments of four other warheads. If the administration wanted to dismantle all “approximately 2,500” retired warheads by 2022 (including those warheads retired after 2009), it would have to dismantle about 312 warheads per year – a rate of only 13 more than it dismantled in 2014. So this can probably be done with existing capacity. Secretary Kerry’s speech is an important diplomatic gesture that will help the United States make its case at the NPT review conference that it is living up to its obligations under the treaty. Some will agree, others will not. The nuclear-weapon states are in a tough spot at the NPT because there are currently no negotiations underway for additional reductions; because the New START Treaty, although beneficial, is modest; and because the nuclear-weapon states are reaffirming the importance of nuclear weapons and modernizing their nuclear arsenals as if they plan to keep nuclear weapons indefinitely (see here for worldwide status of nuclear arsenals). The roughly 500 warheads cut from the stockpile by the Obama administration is modest and a disappointing performance by a president that has spoken so much about reducing the numbers and role of nuclear weapons. Unfortunately, the political reality has been an arms control policy squeezed between a dismissive Russian president and an arms control-hostile U.S. Congress. In addition to updating the stockpile history, the most important part of the initiative is the disclosure of the number of weapons awaiting dismantlement. This is an important new transparency initiative by the administration that was not included in the 2010 or 2014 stockpile transparency initiatives. Disclosing dismantlement numbers helps dispel rumors that the United States is hiding a secret stash of nuclear warheads and enables the United States to demonstrate actual dismantlement progress. And, besides, why would the administration not want to disclose to the NPT conference how many warheads it is actually working on dismantling? This can only help the United States at the NPT review conference. There will be a few opponents of the transparency initiative. Since they can’t really say this harms U.S. national security, their primary argument will be that other nuclear-armed states have so far not response in kind. Russia and China have not made public disclosures of their nuclear warhead inventories. Britain and France has said a little on a few occasions about their total inventories and (in the case of Britain) how many warheads are operationally available or deployed, but not disclosed the histories of stockpiles or dismantlement. And the other nuclear-armed states that are outside the NPT (India, Israel, North Korea, Pakistan) have not said anything at all. But this is a work in progress. It will take a long time to persuade other nuclear-armed states to become more transparent with basic information about nuclear arsenals. But seeing that it can be done without damaging national security and at the same time helping the NPT process is important to cut through old-fashioned excessive nuclear secrecy and increase nuclear transparency. Hat tip to the Obama administration. ← Is China Planning To Build More Missile Submarines?